Following EFE’s Emergency Motion, State of Illinois makes $76 million in payments for people with developmental disabilities, but has to tell court when outstanding payments will be made. 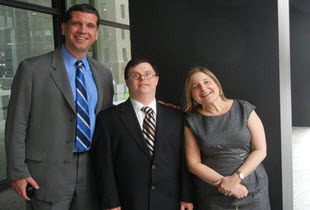 (Chicago, August 26, 2015) Today, Judge Sharon Johnson Coleman heard an emergency motion in Ligas v. Norwood in which the State was required to explain why it has failed to make the court-ordered payments for people with developmental disabilities. The Judge had ordered the State to make payments for people with developmental disabilities by August 18, but payments were not made, and the State failed to inform the Judge why it did not comply with the Court’s order. The State informed the Court that last night it made payments of $76 million for providers serving people with developmental disabilities in small community settings. However, these payments do not cover all the payments required under the Judge’s order. The Judge ordered the State to submit in writing by August 28 at noon 1) which payments have been made, and 2) which payments have not been paid, and 3) when the outstanding payments will be paid. Read the Judge’s Order on August 26, 2015.